10/1 is "Support Our 'Zines Day"
THINGS WE ARE NOT PRE-ORDER BEGINS! Outer Alliance Pride Day 9/1/09 WIN! > M-BRANE #9 RELEASED; Pre-order TWAN and get it for free! M-BRANE #9 RELEASED; Pre-order TWAN and get it for free! 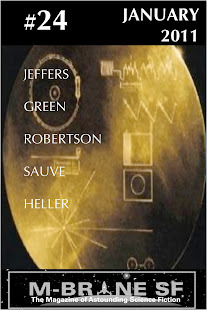 The ninth issue was just released to its writers and PDF subscribers moments ago. The print version and single copies of the issue may be ordered as usual by way of Page 2. 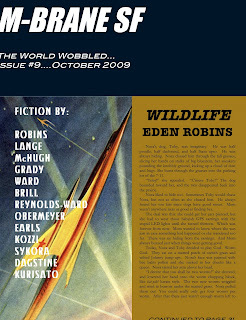 This issue contains, aside from its fantastic stories, a reprint of the author/story intros for Things We Are Not which ran on the TWAN page recently. Also, the list of Benefactors--those great people who donated to the TWAN sponsorship campaign--appears in this issue. This issue is terrific, and the perfect one for new readers to start a subscription, which they can do for FREE by pre-ordering Things We Are Not. As an additional inducement, I should mention that this issue contains Mari Kurisato's story "Lurker," which has a sequel in Things We Are Not. So pre-order the anthology now, and get "Lurker" right away so you are ready for "Connected" in a few days!